Remember how The Corrs captivated our hearts with their downhome sound? I guess it’s about time for someone new to step in. Meet Jamie Rumley, a Folk Rock musician and a one woman band. Her album, “Renovations” was and still is a great hit in Jamendo’s charts. Expressive and very easy on the ear, this album is everything, but boring. Each song was carefully written so as to have easy-to-read lyrics and graceful tune. Jamie’s voice will not only make you listen to her songs, but also will make you fall in love with the Folk Rock genre. 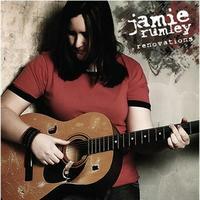 Jamie Rumley has written a lot of songs – to date she has written more than 30 originals. She’s very busy recording her those songs today and had made appearances in several events around Canada. Her exceptional album, “Renovations,” was release back in July 2009. Tracks in this album include “Anywhere but here,” “Thank You,” “Had To Be,” “Blind,” “Lost In Myself,” and my personal pick “Don’t Know Why.” Jamie is very talented. It’s obvious, since she successfully fused the intense sound of the Rock and the lightness of Folk genre into her own. Adding her heartrending words and compelling voice, I’m telling you, the songs in this album are soundtrack-potential. This album can seriously be seen in the top charters shelf of a record bar. Licensed under Creative Commons, “Renovations” is really something and worth to listen to. Folk Rock may not be your thing, but I’m pretty sure you’ll give this one a chance and I bet it’ll make you want to hear more from Jamie Rumley. This work is licensed under a Creative Commons Attribution-Share Alike 3.0 Unported License and is available as a free download from Jamendo.com. Again, Thanks so much and all the best.